On Friday the 3rd of February, the General Court (GC) annulled for the first time a Commission Decision refusing registration of a proposed European Citizens’ Initiative (ECI), on the ground that the Commission infringed its duty to give reasons for its decision. Minority SafePack is a short judgment concerning procedural matters yet at this early stage of the ECI, which was established in 2012, any judgment clarifying the applicable legal framework is worthy of attention from those interested in the ECI and more generally in the opportunities for citizens’ participation in EU lawmaking. For those unfamiliar with the topic, the ECI is an instrument that allows EU citizens to request the Commission to consider an idea as a possible basis for a legislative proposal. Its legal framework consists of Articles 11(4) TEU, 24 TFEU, and Regulation 211/2011 (the ECI Regulation) which sets out the detailed procedure for bringing an ECI. The organisers of an ECI have one year to collect one million signatures supporting their idea in order for it to be considered by the Commission, which ultimately has the discretion to respond. The first step in the entire process is to submit an ECI proposal to the Commission for registration. An ECI cannot be registered by the Commission (i.e. organisers cannot start collecting signatures) if it proposes action that ‘falls manifestly outside the competences of the Commission to propose legislation’ (Article 4(2)(b) of the ECI Regulation). If the Commission refuses to register an ECI, it is obliged under Article 4(3) of the ECI Regulation to inform the organisers of the reasons for such refusal. The Commission sends a letter of reply to the organisers, which it then publishes in the ECI website. Generally speaking, this so-called ‘legal admissibility test’ has been the subject of academic analysis and discussion since the beginning of the ECI, with stakeholders often arguing that the test is an obstacle to the effectiveness of the ECI. 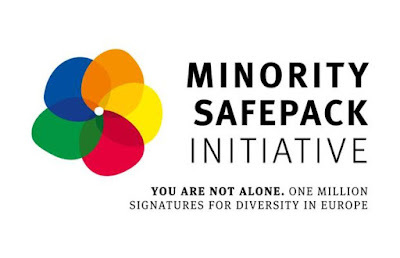 In July 2013, the members of the Federal Union of European Nationalities (FUEN) (hereafter ‘ECI organisers’) submitted their proposal for an ECI entitled ‘Minority SafePack – One million signatures for diversity in Europe’, which they characterised as ‘the most important initiative of the minorities in Europe in recent decades.’ ‘Minority SafePack’ proposed EU action in numerous policy areas aiming to improve ‘the protection of persons belonging to national and linguistic minorities and strengthen cultural and linguistic diversity in the Union.’ In September 2013, the Commission decided to refuse registration of the said ECI on the basis of Article 4(2)(b) of the ECI Regulation. It is the legality of this decision that the ECI organisers challenged before the GC under Article 263 TFEU. According to Article 4(1) of the ECI Regulation, organisers must submit their ECIs through the online Commission register by providing the information specified in Annex II of the ECI Regulation. Annex II requires the following information: the title, subject matter, and objectives of the proposed ECI; the Treaty provisions considered relevant by the ECI organisers for the proposed ECI; personal details of the ECI organisers; and all the sources of funding for the ECI at the time of registration. The word limit for the description of the proposed ECI’s subject matter and objectives are, respectively, 200 characters (approx. 190 words) and 500 characters (approx. 430 words). Notably for the purpose of our discussion, Annex II of the ECI Regulation allows organisers to provide an annex to their registration form with additional information on the subject, objectives, and background to the proposed ECI; and the organisers are also allowed to submit a draft act. The organisers of ‘Minority SafePack’ chose to submit a document with further detailed information about their proposed ECI. The document set out eleven proposed legal actions (incl. a Regulation and a Council Directive) in six areas: language, education, and culture; regional policy; participation; equality; media; and support for minority communities. It also includes a so-called ‘saving clause’, asking the Commission to consider each of the eleven proposals separately on their own merits, and to register only part of the ECI if it considered that only some of the proposals were deemed to be inadmissible (see paras 25-26). In the case before the GC, the first argument of the applicants concerned an alleged infringement by the Commission of the essential procedural requirement to give reasons. The applicants contested the lack of an explanation by the Commission as to which of the eleven acts suggested by the Initiative failed to comply with Article 4(2)(b) of the ECI Regulation and as to why this was so. To that effect, they argued that the Commission infringed Article 296(2) TFEU and Article 4(3) of the ECI Regulation. Moreover, they complained that the Commission failed to explain its position that the ECI Regulation does not allow for the registration of at least a part or parts of a proposed ECI. Indeed this position of the Commission is neither explicitly stated in the ECI Regulation, nor further explained in the letter of reply. Moreover, the applicants also argued that none of the topics for which the Commission was asked to submit a proposal manifestly fell outside the framework of the Commission’s powers to submit a proposal for a legal act (paras 8-12). The main counter-argument of the Commission was that its decision stated the main reasons for refusing the registration on the basis of the subject matter of the proposed ECI as stipulated in the registration form. Any additional information provided by the organisers (e.g. the additional document with the specific ECI proposals) was only indicative and informative, and could not be seen as expanding or limiting the subject matter of the ECI. The Commission stressed that it is not obliged to explain the reasons behind its position that Article 4(2)(b) of the ECI Regulation does not allow partial registration of an ECI (paras 13-14). With ample references to its judgment in the first ECI-related case, namely Anagnostakis v Commission (which concerned the relief of Greek debt), the GC began by reiterating the twofold purpose behind the obligation of EU Institutions under Article 296(2) TFEU to give reasons for their decisions (para 15). This obligation aims (i) to ensure that the person concerned has sufficient information to determine whether the decision is well-founded; and, (ii) to enable the exercise of judicial review over the reasoning of the relevant decision by the EU Courts. In the context of the ECI, this obligation is given specific expression in Article 4(3) of the ECI Regulation. Subsequently, the GC explained that the requirement to give reasons must be assessed vis-à-vis the nature of the measure, as well as the content of the measure and the nature of the reasons given by the EU Institution. It acknowledged that the reasoning does not have to explain all the details behind the relevant decision, but the extent of the obligation to give reasons needs to be assessed in the light of the context of each case (para 16). In the case at hand, the GC explained the context as follows: Article 24(1) TFEU gives citizens a right to submit an ECI (see Anagnostakis para 26), and a decision refusing registration of an ECI may impinge upon the effectiveness of this right. Therefore a Commission decision refusing registration ‘must disclose clearly the grounds justifying the refusal’ in order to enable the citizen whose ECI was rejected to understand the different reasons for the refusal and appraise it accordingly (paras 17-18). It is on this basis that the GC then went on to assess the reasons given by the Commission for the refusal to register ‘Minority SafePack’ (see also para 22). The Commission decision set out three short reasons for the refusal. Firstly, even though Article 2 TEU refers to the respect for the rights of persons belonging to minorities as one of the values of the EU referred to in Article 2 TEU, there is no legal basis for the adoption of legal acts to this end. Secondly, Article 3(3) TEU and Article 21(1) of the Charter also cannot be used as legal basis for EU action. It should be noted here that the additional document submitted by the organisers proposed twenty legal bases for the suggested actions. Thirdly, although some of the acts requested in the Annex to the ECI could fall within the framework of the Commission’s powers, the ECI Regulation does not provide for the registration of part or parts of a proposed initiative. According to the GC, even though the Commission stated the basis for the refusal (i.e. Article 4(2)(b) of the ECI Regulation), the Commission’s reasoning was manifestly inadequate. The Commission failed to identify in any way which of the eleven proposals fell outside the framework of its powers, and failed to give any reasons supporting its assessment (para 27). As a result, the organisers were prevented from identifying the proposals which did not comply with Article 4(2)(b), and from understanding the reasons behind this conclusion. They were also impeded from re-submitting a new ECI proposal, as they did not have enough information about the types of acts that would have been accepted by the Commission. The lack of sufficient reasons also prevented the GC from assessing the legality of the Commission’s response. At a more general level, the lack of a complete statement of reasons discouraged citizens’ participation in democratic life and was contradicted the objective of the ECI to make the EU more accessible to citizens (para 29). In addition, the GC reiterated its ruling in a previous ECI-related case - Izsák and Dabis v Commission (currently on appeal) - that the Commission should have considered the information provided in the organisers’ annex as being equally important to the mandatory information required by Annex II of the ECI Regulation. According to the GC, Annex II of the ECI Regulation gives a right to the organisers to submit additional information to the Commission. Since Annex II has the same binding force as the ECI Regulation, the Commission - ‘in accordance with the principle of sound administration’ (para 32) - has a duty to consider any additional information in the same way as it considers the mandatory information required by Annex II. Therefore, the Commission’s replies must include the reasons behind the refusal of an ECI in light of all the information submitted by ECI organisers. At first sight, the judgment is good news for future ECI organisers, as it recognises the effort needed to put together a legally sound ECI proposal, as well as the limitations in doing so only through the mandatory information required by Annex II. Had the GC sided with the Commission’s position, organisers may have found themselves in the position where they would invest time and effort into writing a proposal stipulating specific legal bases only for the Commission to then say that it was not obliged to justify its views on the additional information and the draft legal acts submitted by the organisers. The Commission itself acknowledges that it takes into consideration all the possible legal bases in considering whether a proposal meets the conditions for registration (para 30), so it should not be an onerous task to expand on its rationale vis-à-vis the specific proposals of organisers. Upon closer inspection, it would appear that the GC’s finding in this and in previous ECI-cases is not necessarily or always helpful for ECI organisers. This observation becomes apparent when one looks at the previous case of Iszak and Dabis, which concerned the refusal by the Commission to register a proposed ECI named ‘Cohesion policy for the equality of the regions and sustainability of the regional cultures.’ Interestingly, the applicants in that case made the same argument as the one made by the Commission in Minority SafePack: additional information should not be given the same weight by the Commission as that given on mandatory information. The GC disagreed with the applicants, finding that ‘the “Information set out in Annex II” to which Article 4 of the [ECI] Regulation refers, is not limited to the minimum information which must be provided in the register under that Annex.’ In the view of the GC, this finding does not depend on whether or not the additional information was or was not in the applicant’s interest. It seems, therefore, that the Court’s judgment could play out in two ways for potential ECI organisers. On the one hand, ECI organisers may be able to rely on it to challenge the Commission’s reasoning where the latter has not adequately dealt with the additional information submitted in the registration stage. On the other hand, the Court’s finding will probably not be particularly helpful for ECI organisers whose ECI might have been accepted if only the mandatory information had been submitted, but was rejected because of the additional information. On a final note, it is rather unfortunate that the GC did not clarify one other procedural aspect of the ECI. As mentioned above, the Commission stated in its decision that an ECI with only some objectives fulfilling the criteria of Article 4(2)(b) cannot be registered. The GC left open the question whether this interpretation of the ECI Regulation, which is not specified anywhere in the ECI legal framework, is legally sound. In para 34, the GC held that it is not necessary to rule on this question, confining itself to finding that the Commission failed to comply with its obligation to state reasons. This could be seen as implying that the Commission may need to justify its interpretation of Article 4(2)(b) of the ECI Regulation, but this finding does not take away from the question of whether the Commission’s interpretation of Article 4(2)(b) is correct. Let’s assume, for example, that the Commission does, indeed, explain the rationale behind its interpretation of Article 4(2)(b) with regard to partial registration. This would not automatically mean that the interpretation is legally sound in the light of the Treaty Articles 11(4) TEU or 24 TFEU or the ECI Regulation. This is not to argue that the Commission’s current interpretation of Article 4(2)(b) is correct or not. It is simply to observe that a clarification of this point by the GC would have been useful. The ECI is still a young instrument, so every clarification of its legal background is helpful for its development. In this regard, the judgment in Minority SafePack is a welcome addition to the body of law comprising the ECI. The reaction of the Commission remains to be seen. See, for example, A. Karatzia, “The European Citizens’ Initiative in practice: Legal admissibility concerns”, 40 EL Rev. (2015), 509–530 and J. Organ, “Decommissioning Direct Democracy? A Critical Analysis of Commission Decision-Making on the Legal Admissibility of European Citizens Initiative Proposals” (2014) 10 Eu. Const. 422.